Cyber Monday is the day when online retailers push their best deals of the year that you won’t find in stores! If you haven’t already spent all your money on new boots this weekend, rejoice as there are some killer deals on offer that you won’t want to miss. The biggest deal of the day is available at soccer.com, especially if you are a Goal Club member. In fact, I take that back. You should be a Goal Club member. The deal is simple and based off how much you spend; spend $99 and get $25 off, spend $150 and get $35 off, spend $200 get $50 off. Basically, it means you are getting close to 25% off your purchase. But you need to be smart about your purchase and the listed prices. Here is our list of top deals not to miss out on today at soccer.com, using the above deals. 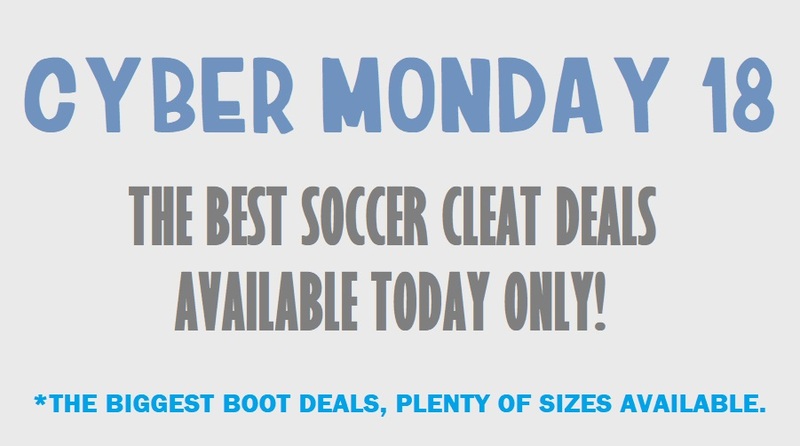 Each of the Cyber Monday deals below are based on Goal Club pricing and result in some HUGE deals. Make sure to use both codes listed to drop to the best price possible. This is a Cyber Monday deal, so as soon as Tuesday hits, the deal is off! How many times are you going to have the opportunity to own a handmade pair of boots at this price? When it comes to Mizuno, you know you are getting a quality boot that stands out from the rest. Use code CYBER and SHIPFW during checkout. A blackout pair of Copa’s for around $100? YES PLEASE! We are talking one of the last remaining traditional style boots in the color they are supposed to feature. Black on black. These are a quality addition to every players boot collection. Use code CYBER and SHIPFW during checkout. If you have been waiting to check out what Concave technology is all about, this is probably the perfect time. Performance wise, these are the best Concave boot released to date, thanks to the knit collar that works in unison with the Concave component. Use code CYBER and SHIPFW during checkout. Puma’s boot intended to revolutionize the market, with a NETFIT system that allows you to customize your fit however you need. I’m a huge fan of what these have to offer on pitch. Use code CYBER and SHIPFW during checkout. This is one that is running out really quickly, but it is definitely worth a shoutout. The leather Predator wasn’t available in the US up until a few weeks back, so the fact they are now available at a really low price should be all the enticement you need to pick up a pair! Use code CYBER and SHIPFW during checkout. Not only is this an incredible price on a boot just released to market, but they also feature something unique compared to other X18 releases; PRIMALOFT. If you haven’t heard about Primaloft yet, it is an inner layer that keeps heat in, insulating your feet in cold conditions. Something that is sure to come in very handy during the winter! Use code CYBER and SHIPFW during checkout. Sure to be a top request on a lot of people’s Christmas wishlist, grab a pair of the same boots worn by Cristiano Ronaldo at a ridiculously low price. These are the latest Chapter 7 of 7 releases that tell the Cristiano story, and feature his signature imprinted on the heel, a cool touch! Use code CYBER and SHIPFW during checkout. Brand new to the market, you won’t see a price like this again for a while. And yes, I’d choose the laces 19.1 over the laceless Copa 19+ just to ensure they fit comfortably out of the box. Use code CYBER and SHIPFW during checkout. If someone told me that there would be pairs of Nemeziz 17+ available for $100, I’d have called them crazy. These are the lowest we have EVER seen on a laceless adidas boot, plus they come with free shipping. Use code CYBER and SHIPFW during checkout. What is better than a pair of boots on sale? What about three top tier boots for the price of….well……less than 1 pair. Take it to the next level with a game pair, a practice pair, and a pair you’ve never had the chance to try before. Add all 3 to your cart, or mix and match with others, then use code CYBER and SHIPFW during checkout. Cyber Monday Price: $150 for all 3 pairs.